Pictured are Mike and Ryan Harbour, Charles E. Mansfield, Constance White, Jean Hilton,Eddie Wolfe, Tom Galloway, Tim Ihle, Noah Anderson, Keith Whaley, Dale Colburn, Jacob Hoback, Sam Rosser and Betty Ashley Snow Rosser. The North and South come together with Mike and Ryan Harbour as Union Troops, Charles Mansfield and Eddie Wolfe as Confederate soldiers and Sam Rosser in an authentic Union uniform. Union soldiers stand watch as wreaths are placed at the Civil War Memorial, honoring the 505 know Union troops from Meigs County who died in the Civil War. Speaker Keith Whaley on the history of the 75th Infantry Company D, Middleport. Betty Ashley Snow Rosser and Sam Rosser; “When Johnny Comes Marching Home”. POMEROY — The day was sultry and the sun danced with clouds to keep the rain at bay until the May 30 Decoration Day observances were completed. Held at the site of the Civil War Memorial, located at the Meigs County Courthouse, it might have been a typical Southern spring day in 1866 where the first Decoration Day observances took place. Ladies in dresses made of heavy fabric, their skirts hanging atop oval hoops, were fanning themselves. One carried a lace parasol to shield her from the sun. Soldiers in wool uniforms stood at attention, ignoring the perspiration streaming down their faces. Another soldier, looking as if he had just been called from the fields to fight alongside the regular Southern troops, occasionally removed his straw hat. As wreathes were placed at the Memorial, music played, and if not for an occasional passing car, it was easy to forget the year was 2015. The ceremony began with Dale Colburn introducing the participating groups: Sons of the Civil War Middleport Brook Grant Camp 7, Daniel Cook Circle 104 of the Lady’s of the Grand Ole Army of the Republic, 91stst Ohio Valley Infantry, Buffington Island Preservation Foundation, Morgan’s Raid Reenactment Committee and the Ohio Horseman’s Council. 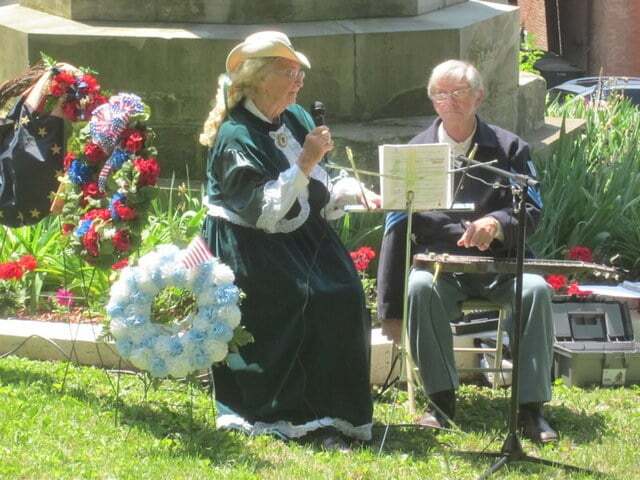 Wreaths were placed at the foot of the Monument, and Constance White sang the Battle Hymn of the Republic. Charles Mansfield lead the group in prayer. A brief history of Decoration Day was given by Jean Hilton. Recalling local springtime tributes to the Civil War dead in the South, one of the first occurred in Columbus, Miss., on April 25, 1866, when a group of women visited a cemetery to decorate the graves of Confederate soldiers who had fallen in battle at Shiloh. Nearby were the graves of Union soldiers, neglected because they were the enemy. Disturbed at the sight of the bare graves, the women placed some of their flowers on those graves, as well. The head of an organization of Union veterans, the Grand Army of the Republic (GAR), established Decoration Day three years after the Civil War ended. Maj. Gen. John A. Logan declared that Decoration Day should be observed as a time for the nation to decorate the graves of the war dead with flowers. May 30 became the official day. By the late 19th century, many communities across the country had begun to celebrate Memorial Day, and after World War I, observers began to honor the dead of all of America’s wars. So did the change from the Southern observance in April to the official date established in May have anything to do with lingering animosities between the North and South? Mansfield added that he doesn’t think this was the case. Instead, it was because flowers that were placed on the graves at that time were picked from gardens and meadows. Northern graves were decorated in May when flowers begin to bloom in the north. Flowers begin to bloom in the south a month earlier, so by making the date in May, flowers would be blooming in both locations. A plaque was presented to Carol Mourning in honor of her husband, Jim Mourning, who passed away recently. The group recognized Jim as a wonderful person who contributed much to the preservation and history of the Civil War. Speaker Keigh Whaley talked about the history of the 75th Infantry Company D. The company was formed in Middleport in 1861, and Whaley’s great-grandfather served in the unit, which had many encounters during the war. Betty Ashley Snow Rosser sang “When Johnny Comes Marching Home,” accompanied by Ken Sams on a lap guitar. A closing prayer was offered by Mansfield, who prayed for a safe return for all soldiers who are currently serving. When the prayer ended, Taps, played by Jacob Hoback and Noah Anderson, echoed behind the courthouse, a solemn reminder of the reason for the observance. According to sources associated with the groups participating in the Decoration Day observance, more Civil War events and re-enactments are planned, especially for 2016. Reach Lorna Hart at 740-992-2155 EXT. 2551.